I started working at Oneota Food Co-Op in 2008 and sometime after that, I met Erin. During our times at the register, I don't think I ever realized that she rode a bicycle, but who am I kidding? I didn't start riding until 2012. At some point this year, Travis suggested I contact Erin-and here we are! As a youngster, though high school is when I started riding more distances. More recently my son, Peter, and I did the MS 150 in MN to raise money for M.S. (which my mom has). My favorite is probably taking country road-biking trips (southwest Wisconsin country roads are awesome- blacktopped and quiet, though hilly.) 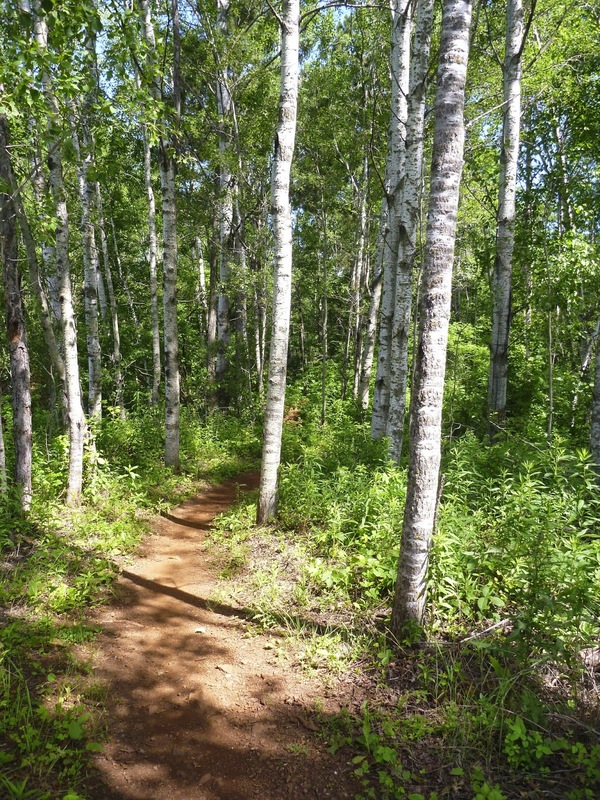 Mountain biking is a close second (Decorah trails, Levis-Trow Mounds, north of Black River Falls, Wisconsin, and the Cuyuna bike trails near Brainerd, MN are all favorites). Rails to trails riding like Trempleau, WI or the Sparta-Elroy Trail in Wisconsin are also so fun with kids. (Check out these spots; they are great!) Tandem biking is also so much fun. It’s the best way to bike with my husband, as he’s too speedy for me unattached and it’s a great trust exercise! With my husband’s persuasion, I have just bought a pair of clipless pedals. I’m so curious to see how they work! Everyone who has them says they make such a difference. I work from home, but have a pair of panniers that I can stuff lots of things into to make biking around town easier. Yes. I wear leather mittens, leather hiking boots, and rain pants when it’s cold. The Blackburn pannier holder on my back tire works like a fender to keep mud and water from splashing up on my back in the rain. I love the fresh air and the physical and emotional lift that it brings to me. The scenery and the company (when I have it) are priceless! I have a ten or so year old Trek 8000 women’s mountain bike that I really like. I picked it because I could buy it locally and it fit me great (the women’s fit helped a lot). I also got a hand me-down Trek 1000 road bike that I like to ride on the roads and around the local bike trail. I love my bike skort because it has great padding without the tight classic bike shorts to leave my bum hanging out for the world to see. I absolutely love my panniers and the Blackburn rack that’s over my back tire. I can hook a pannier or two on the rack or just bunji something to the top of it. I also really like the knog frog bike light that you can change from bike to bike so easily.